Does your puppy have growing pains? Save time and grab your FREE Pano Formula Recipe Card with the full step by step instructions on how to feed this proven panosteitis home remedy. And for your convenience, I have compiled all of these supplements in one place in my Amazon Shop here. Junior was 16 weeks old when I began to notice some alarming changes to his behavior and movement. Over the course of a few days, I observed my once silly, playful mastiff puppy become less and less interested in playing. Starting on Saturday at Puppy Socialization class, I noticed him sitting back more from the other puppies and preferring to watch them rather than get in the middle and play as he had done during previous classes. He was so laid back that afternoon that a few of the other puppy owners in class asked if he was “always so calm?” I laughed it off in that moment, but over the next couple days, the changes in his movement proved this was no laughing matter. On Sunday I found myself having to really work to get Junior to either want to play or to get up from a sitting or lying position. In typical mastiff fashion, he never cried, yelped or whimpered, but I could see my puppy was in pain. The movement in his rear legs was clearly off to me. Something was terribly wrong! After a trip to Junior’s vet and consulting with his breeder, after ruling out other possible causes such as an injury, both agreed the most likely cause of my puppy’s growing pains was Panosteitis. “Pano…what” you ask? Panosteitis, or Pano as it is often referred, is a self-limiting and very painful condition in the long bones of young dogs (between 4-18 months of age). It is a common cause of pain in dogs. While panosteitis is most common in large and giant breed dogs, it can occur in smaller breeds as well. Pano is caused by too rapid growth of the long bones which leads to inflammation. This inflammation can affect one or more of the dog’s legs, most commonly in the front, but also in the rear, making it very painful for the dog to move. The most common symptoms are limping and soreness due to the inflammation deep within the bone. However, some owners report their dog limping on their front leg but with no obvious signs of pain. Some dogs can also exhibit, fever, depression, weight loss, and anorexia, or in severe cases left untreated, atrophy of the muscles due to lack of use. 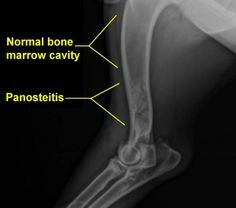 If you suspect your puppy might have panosteitis, you should get a formal diagnosis (usually with an x-ray) from your veterinarian first. There are other things that would cause the same symptoms, like elbow dysplasia or a shoulder problem, or OCD. There are times to save money on a vet – this is not one of them. Please listen to your veterinarian and follow his/her recommendation. However, if your dog is in pain and you are wondering what you can give him at home for pain relief, keep reading. 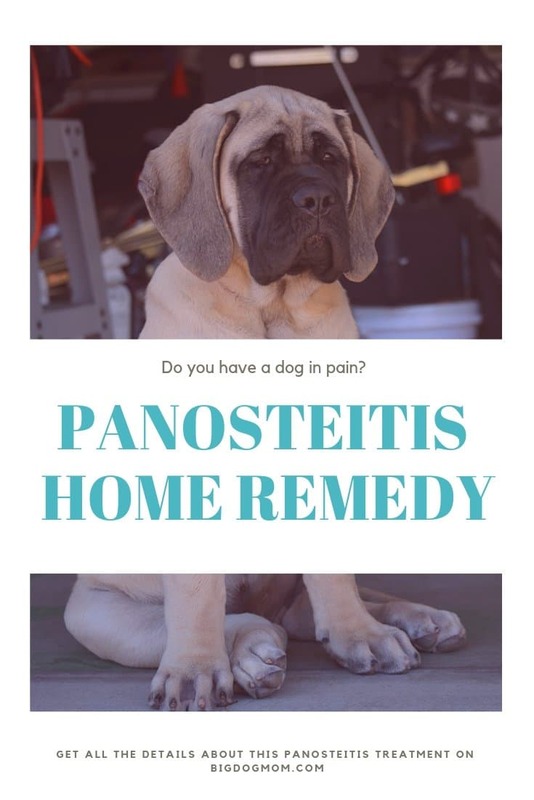 If Pano is the diagnosis, the following is a nutritional panosteitis home remedy that has been used within the mastiff community for many, many years with tremendous success. It has been used both as a preventative and a panosteitis treatment once a puppy starts showing symptoms. If you are looking for a safe way how to treat a limping dog at home, this just might be the answer you are looking for. NOTE: I will say again that this formula DOES NOT take the place of the advice of your veterinarian. I provide it as an adjunct to, not a replacement for, qualified medical advice. Alfalfa contains Saponin, which may have some anti-inflammatory properties. Additional research in baby chicks have showed that saponins appear to be partly responsible for a decreased growth rate in those chicks fed alfalfa. One of nature’s richest sources of omega-3 fatty acids (EPA & DHA) which have natural anti-inflammatory properties. Cod Liver Oil is also an excellent source of vitamin D which plays an essential role in healthy bone metabolism, and a great source of vitamin A, an important antioxidant that reduces oxidative stress thereby inflammation levels. HEART, BRAIN, VISION & JOINT HEALTH: Carlson Norwegian Cod Liver Oil provides the beneficial omega-3s EPA and DHA to support heart, brain, vision, and joint health. 1,100 MG OMEGA-3S: A single teaspoonful provides 1,100 mg of omega-3s. Vitamins A and D3 are also found in Cod Liver Oil. AWARD-WINNING LEMON FLAVOR: All flavors of our high-quality liquid fish oils have been honored with Superior Taste Awards from the renowned chefs and sommeliers of the International Taste & Quality Institute (iTQi). Wheat germ makes up about 2.5% of the wheat kernel, but is packed with nutrients. It is high in octacosanol which helps to enhance endurance, performance and reaction time during physical activity. Wheat germ is also a wonderful source of vitamin E and unsaturated fatty acids, such as omega-3, which have strong anti-inflammatory properties. Studies have shown wheat germ oil helpful in reducing pain in people suffering from rheumatoid arthritis through its anti-inflammatory action. Lecithin is important for the functioning of a key neurotransmitter, acetylcholine, which helps nerves communicate and muscles to move. It is a source of an essential micronutrient, choline. Choline plays a role in methylation, a process which affects every cell in the body (create DNA, nerve signaling, detoxification). Yogurt contains calcium and probiotics. Calcium, together with adequate levels of vitamin D, play a major role in increasing bone density and supporting overall skeletal health. Many brands of Yogurt contain the good bacterium, lactobacillus acidophilus. L. acidophilus is key to your digestion of dairy products and produces vitamin K, which is essential to proper blood clotting and bone formation and repair. For more on probiotics like L. acidophilus, read Probiotics for Dogs: The Facts and Strains that Matter Most. World Health Organization uses the egg as the standard for evaluating protein quality in other foods. Free-range eggs are high in omega 3’s and choline which decrease inflammation. Eggs are one of the few natural sources of collagen when uncooked. Collagen provides joint and connective tissue support, increases range of motion, and decreases pain and stiffness. Want this information TO GO? Get your FREE Pano Formula Recipe Card with the full step by step instructions on how to feed this proven panosteitis home remedy. And for your convenience, I have compiled all of these supplements in one place in my Amazon Shop here. So, I am sure at this point you are wondering what happened with Junior. How is my dog’s leg pain since starting the panosteitis home remedy? The day I spoke with Junior’s vet and breeder, I switched Junior’s diet from raw to a lower protein kibble and started Patty’s panosteitis treatment. I could see improvement the next day with his movement and playfulness and within 3 days he looked like a new dog! While I am a FIRM believer in a raw diet and have fed raw for many years to Sulley with no issues, I surmised Junior’s issues were due to the chicken in his diet. Chicken is extremely high in Omega 6 fatty acids and is a pro-inflammatory meat. The exact opposite of what I should have been feeding him, especially when he was in pain. Junior comes from a line of huge boned mastiffs, many of whom suffered with leg pain, limping and growing pains from panosteitis, so I plan on keeping Junior on Patty’s pano home remedy until he is a year old as a preventative. I would love to hear about your experience with pano. What treatments have you tried and what were the results? Have you tried this panosteitis home remedy? Tell me what you think in the comments below. Please also consider sharing this if you feel it could help other big dog owners you know. Consider pinning one or both of the PINS on this page and downloading your FREE Pano Formula Recipe Card! Spot on with this write-up, I truly think this site needs a great deal more attention. I’ll probably be back again to read through more, thanks for the information! Thank you! I am happy you enjoyed this post. Yes, you will see that I will be adding much more content in the days and weeks ahead. Definitely stop back or feel free to sign up as a subscriber and you will get notified when I have new posts. I have a 9month Golden Retriever puppy that presented just like your Junior. Ava was crazy hyper and energetic to laying around lethargic abd depressed at times. I have to make her boiled chivken and rice. She will not eat kibbles. Do you think I should try this with my Golden? I’m so sorry to hear your Golden isn’t feeling well. As long as you’ve had her seen by a vet that has ruled out injury or some other cause for her change in behavior, I think you would be safe to start this. But I wouldn’t diagnose pano without a veterinarian’s input. In Junior’s case, my vet ruled out injury and together, given Junior’s age, size, and breed, we determined his issues to be panosteitis. I hope this helps! Do I put all of this on one bowl of food? Hi Shaun – yes, you will mix all of the ingredients together and feed with your dog’s regular meal. Greetings! I’ve been reading your site for some time now and finally got the courage to go ahead and give you a shout out from New Caney Tx! Just wanted to mention keep up the good work! Hello and thank you! I greatly appreciate the kind words. Please feel free to comment anytime and provide your feedback. I look forward to hearing from you!! What’s up, just wanted to mention, I enjoyed this post. It was practical. Keep on posting! Thank you very much! I am so happy you enjoyed this post! We have a 6 month old male mastiff that seemingly out of nowhere started experiencing sever acute pain in his front legs. After a trip to a vet where little was accomplished other than some anti inflammatories and pain medication, I started some research where I learned of pano. I too have been raw feeding Samson because after loosing our third dog to cancer I truly believe the commercial dog food industry has a lot to to with the hi cancer rates. Anyway, I thought we had a good slow growth rate which was consistently four pounds a week which put him at 100lb at 6 months. I also feel that in his case I have his calcium levels too high and not necessarily his protein. I am really struggling with going to a kibble so Im trying a dehydrated base from the “honest kitchen ” brand and adding my own protein source. My intent is to lower the bone content in his diet as well as the over all protein level to slow his growth rate down. In addition to this I started pattys pano plan today. I truly hope it helps and that I can find the right nutrition level to raise a strong healthy dog for many years to come. If you should have any thoughts that may help they would also be greatly appreciated . In addition thanks for the good information provided here regarding the ingredients and their properties. Hi John – I apologize for the delay in responding. Thank you for your kinds words, and I’m sorry about what you and your boy are going through. Junior and I were in the same boat not that long ago. I have three articles related to feeding a raw diet and struggling with growth issues. I definitely recommend reading those for the background on what I was dealing with back in January. I have had lots of time and done enough research I think to have a few theories as to why my Junior had some issues on his raw diet early on. I originally thought I was giving too much bone and possibly feeding too much as well. While both are not good or balanced, I am not sure that was the cause for us. I believe it had to do with feeding chicken. I will link to the article that I believe explains why today on my Big Dog Mom Facebook page (@bigdogmomusa) in case this might help you as well. It does sound like your boy has a touch of pano. While I’m not a vet, I would consider adding some of the supplements in Patti’s recipe to see if that doesn’t help. The raw diet I feed today is different than what I was feeding back in January due to more research on my part. It includes less than 5% chicken – 95% beef, pork, fish, turkey, & duck and whatever else I can get from my co-op. I also balance their meat, bone, and offal ratio daily which I wasn’t doing before. Lastly, while I dislike kibble as much as you do, you have to do what is right and best for your boy. I was at a loss with Junior and needed time to figure out what I was doing wrong so that’s what I did. Because mastiffs are so big, commercial raw diets aren’t in the budget for most people, but that would be an option as well if you can afford it. I guess what I’m saying is don’t beat yourself up and realize nothing you do has to be forever. It can be for just a month or two while you figure things out. I hope some of that is helpful. I would love an update on how your boy is doing. Hi. How long do you keep feeding the formula after the symptoms have subsided? Do you slowly ween the dog off it? Feed every other day, or twice a week? Hi Ron – Thank you for your question. The answer varies depending on who you ask. I only used this formula for a short time while Junior had his bout with Pano, and then off and on as needed. When he was painful, I would feed it once a day, every day for a week or two depending on the severity. That said, many in the mastiff community swear by it and use it pretty consistently for the first year of life. I am not a vet and would definitely consult your veterinarian whatever you decide to do. When you say to mix ingredients together in their entirety and feed over food, do you feed ALL of the mixture once/day? Is this dependent on pup’s size/weight/age? Hi Kelly – Yes, that is what I have done. Some mastiff people I know continue to feed the pano recipe for their puppy’s first year, however, I only ever fed it as needed. This recipe was developed by a mastiff breeder primarily for mastiff puppies. You can definitely adjust the amounts down if your puppy is significantly smaller than that. Pano is quite common in large and giant breed puppies before the age of 1 so age shouldn’t be a factor unless they are much older than this. I would not start it on very young (less than 8 weeks) puppies either. I hope that helps! What kind of kibble did you move to during the bouts of pano? In the spirit of full transparency, when Junior was first diagnosed with Panosteitis, I switched him to adult Dog Chow. He was about 12 weeks old at the time. I wrote about that in this post if you would like more of the background (https://bigdogmom.com/2017/08/09/dog-food-no-guilt/). I have learned so much since that time, that I would not recommend doing what I did, though he did get better almost immediately. The general rule of thumb with large and giant breed puppies is that you want to slow down their growth as much as you can. If you do not want or can’t go to a natural, raw diet, choosing a food that is low in protein and has a close balance of 1:1 Ca/Ph ratio are important factors to consider. I list a few different brands that I have used in the past. Zignature is one of the better ones in my opinion if you can find it. I hope that helps. I have written quite a few posts on the topic of canine nutrition, raw feeding and my journey with Junior and Sulley so I encourage you to read those when you have a moment. I am always here if you have additional questions as well. Best of luck! Hi there, my name is Megan. I have a 6 month old Bullmastiff that was diagnosed with pano around 3 months. We have been treating him with rimadyl and tramadol which does not seem to help with the pain like i would like it to. It kills me to see him in pain like that. I was interested in trying this food recipe and was wondering about the alfalfa tablets and if you just drop the tablets in and how you decide how many to use. Your help would be really appreciated! Thank you so much. Hi Megan – thank you so much for your question. I am so sorry that your bullmastiff puppy is in so much pain. I know how heartbreaking that can be to watch. Assuming this is pano and not due to an injury or other cause, when I was treating Junior, I used the 650 mg tablets and would grab between 5-10 of them. I would just mix them right in with his food and he never had an issue eating them. Remember, pano is caused by too rapid growth in the long bones of large and giant breed puppies (primarily). You want to try to slow down that growth, and reduce the inflammation (which is causing the pain) as much as possible through diet and supplementation. All of the ingredients in this pano recipe are geared toward slowing growth and reducing inflammation. I hope that helps. Please keep me posted on how your puppy is doing. Best of luck! Hello! I know I’m very late to this party, but just got a diagnosis of pan on my just 6 month old mixed large breed. She looks all mastiff! “Edith” has been on anti inflammatory for two weeks and confinement with no results.. Starting this diet plan today! Do I feed it three times a day? And should I gradually cut back to the low protein kibble, mixing with her current high protein puppy kibble? She is also a farm girl and gets plenty of raw bones to chew. Cut those out? Sorry if repeat questions. And thank you for giving us hope! Hi Pollyanna – thank you so much for such great questions. I’m so sorry about Edith’s pain. I’m assuming your vet has diagnosed her with pano and ruled out all other possible causes for her pain. If that’s the case, here’s what I would recommend as it relates to using this formula. Feed her twice a day if that’s what you have been doing. There is no reason to feed more often. Secondly, I would be very cautious about feeding a “high protein kibble” to her at all if she is a large or giant breed puppy. I recommend feeding these puppies an adult diet which facilitates slower growth. So, if I were you, I would transition her to an adult kibble, that is if you are unable to feed her a raw, natural diet. The raw bones should be completely fine and great to feed her depending on what they are. Just add the formula (eggs, cod liver oil, etc) to her kibble and feed as you normally do. No need, other than the high protein kibble, to change anything you are doing in my opinion. Let me know what additional questions you have. Keep me posted on her progress. Hi! Our 9 week-old puppy just got diagnosed with pano after only having her for a week. 5 trips to the vet, fever, listlessness. We are relieved to finally know what it is. Is cod liver oil ok to give to a puppy this young? She is a multi-gen labradoodle. Right now she is eating the Kirkland brand chicken and pea dog food as recommended by the breeder, but now I’m tempted to wean down her chicken. Hi Angie – Huge congratulations on your new puppy and thank you for your question. First, I definitely don’t think there is a problem with giving cod liver oil to a puppy. Some of the big dog breeders I know start giving this formula around 8 weeks or so as a preventative because pano is so common for giant breed puppies. You can cut the amounts in the formula to about half given your puppy is not very old and is likely on the smaller side given her breed. I think you are right to consider a diet change. The peas aside which I know have gotten some recent press, chicken is definitely going to contribute to worsening any inflammation she is experiencing. If you can offer a protein like beef, lamb, or turkey, those are going to help reduce the inflammation. I am assuming with all of this that your vet diagnosed the pano and that he/she ruled out any type of injury. If that’s not the case, be sure to have her checked by a vet. I hope this helps. Feel free to comment below and let me know or email me directly as well. Good luck! I’ve just rescued a Dobie X German Shepherd puppy and my vet suspects Pano. I’ve started her on your diet but at only 18kg and roughly 4.5 months I’m guessing she’s smaller than Junior was so was thinking of halving the amounts – what do you think? Thank you so much for your question, Eleanor! Yes, I don’t think there is anything wrong with cutting back on the amounts of this formula, however, you may want to keep the relative amounts the same. So in other words, if you choose to decrease it by 50%, reduce all of the ingredients by 50%, so that you keep the balance the same. I hope that makes sense. Best of luck with your new puppy!! I bet she’s a cutie! Thank you for the recipe and for posting this for us big dog owners. My questions are rather simple and more a need for clarification. The recipe calls for 7500mg of alfalfa tablets, is this per a day?Should the alfalfa tablets be crushed or pulverized? Do you feed them the entire recipe/concoction at once or do you separate into each separate feeding? I have a 4 month old GSD. Thank you for your questions, Eric! So, yes, the amount would be given per day and I just tossed the tablets in Junior’s food whole. Junior never had a problem eating them right with the rest of his food. And I just added everything into one meal, but you don’t have to. You might have to play with it depending on how finicky your puppy is about new tastes. Junior never had a problem with it, but every dog will be different. And feel free to cut back on the amounts since my guess is your puppy is significantly smaller than a 4 month old Mastiff puppy. If you do cut it back, do so in the same relative amounts. Keep the proportions the same between ingredients. I hope this helps! Please keep me posted on how your puppy is doing. Best of luck!! The alfalfa came in capsules. I just pulled them apart and mixed with the other ingredients for my GS. Good luck! I haven’t used capsule – the alfalfa I bought was in hard tablets. I’m sure pouring the powder from inside the capsule is fine, unless the product packaging says otherwise. Thank thank you thank you! My 90lb 1yo German Shepherd was diagnosed with pan last week. The vet suggested a few ideas, but said he would grow out of it. Leo was in so much pain, depressed and losing weight fast. My husband found your website, I bought the ingredients and 1 day later I see a huge change in his disposition. He is smiling, relaxed and ready to eat. First time in two weeks. I can not wait to see what the future brings. My rescue dog they thing border collie and lab mix was just diagnosed with pano. After many stressful tests I was a bit relieved. He is only 37 pounds , what would the amount be for this diet? Should I switch him to a adult dog food permanently or just when he has his painful episodes. Thank you for your questions, Kristen! You didn’t mention how old your dog is, so I would venture to say, yes on the adult dog food since you referred to him as a dog and not a puppy. That’s an assumption on my part, so let me know if that’s not the case. As far as how much to feed, I would probably just decrease the amounts by about half and see how he does. None of the supplements on this list will hurt him if given in the amounts suggested, but I think you’d be fine to decrease them by 50% as well and still get the benefits. Very helpful recipe, our 6 month german Shepard was having pano really bad and this turned him around so he was feeling better and not favoring his lame leg in a matter of 2 or 3 days. Thank you very much. That is such wonderful news, Aaron! I’m so happy your young boy is doing better!